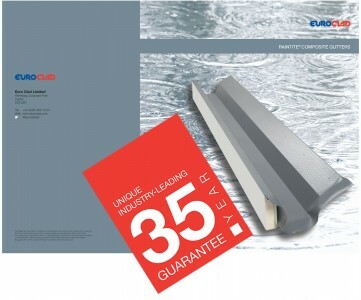 Euroclad has leveraged decades of experience and key strategic partnerships to offer a new range of Raintite® composite gutters. This unique offer features the only 35-year guarantee in the industry, when installed as part of an Elite System. Raintite® can provide the solution to all of your gutter requirements, taking advantage of tried and tested technology, developed and refined over a period of 60 years. PVC membrane technology is used to create a bonded steel sheet, with a unique slip resistant surface and standard, bright-white liner. The gutters can be insulated with stone wool or PIR insulation, or can be uninsulated. For more information or to get a quote please email dale.evans@euroclad.co.uk or telephone 02922 010101 and ask for Flashings.